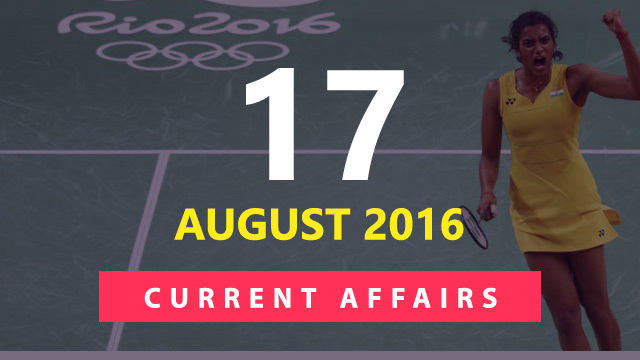 Hi Aspirants, here are the Current Affairs Updates for 17 August 2016 covering the important happenings for the day. 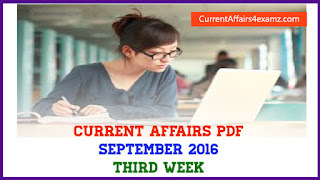 These questions will be very useful for all upcoming exams like IBPS Clerk 2016, RBI Grade B Officer, SSC CGL 2016 etc. 1. Name the former Union Minister who was on 17 August 2016 appointed as the Governor of Manipur? Note: She had served as Union Minority Affairs Minister in the Union Cabinet of NDA Government led by Prime Minister Narendra Modi and had resigned in July 2016. 2. Who was on 17 August 2016 appointed as the Governor of Assam? Note: He is a three-time former member of Lok Sabha from Nagpur and Managing Editor of Central India’s daily ‘The Hitavada’. 3. Who was on 17 August 2016 appointed as the Governor of Punjab? Note: He hails from Rajasthan and is associated with Mayo College, Ajmer. 4. Who was on 17 August 2016 appointed as the Lieutenant Governor of Andaman and Nicobar Islands? Note: He is Delhi-based BJP leader and former MLA from Delhi. 5. The first South Asian Association for Regional Cooperation (SAARC) Youth Parliamentarians Conference on `Peace and Harmony for Development’ was held from August 16 to 18, 2016 at? 6. Name the World famous prominent Punjabi writer, novelist, short story writer and Jnanpith awardee who died on 16 August 2016? Note: He was one of the greatest writers of Punjabi Literature and had focused on the economically and socially marginalised people in rural Punjab in his short stories and novels. 7. Name the former president of Fédération Internationale de Football Association (FIFA) who died on 16 August 2016? Note: His tenure as President in FIFA is the second longest behind only that of Jules Rimet. 8. Statue of Sister Nivedita was recently (August 2016) unveiled in which country? Note: Sister Nivedita was a great disciple of Swami Vivekananda. 9. Name the noted Malayalam scriptwriter who died on 15 August 2016? Note: He started his career as a scriptwriter in 1991 for Mohanlal-starred “Vishnulokam”. As a scriptwriter, his notable films include Kanakinavu, Ghazal, Perumazhakalam, Aayirathil Oruvan and Thalolam. 10. Name the first Speaker of Delhi Assembly and father of Union Sports Minister Vijay Goel who died on 16 August 2016? Note: He became the first Speaker of Delhi Assembly in 1993& continued in the post till 1998. 11. India’s PV Sindhu on 17 August 2016 defeated world number two ___ of China to enter the semi-finals of the Rio 2016 Olympics? Note: She became only the second Indian women’s player after Saina Nehwal to reach the semi-final of Olympic. 12. Tata Power Solar has recently commissioned a 100 mw solar project for NTPC at? 13. Name the Indian music composer who was recently honoured with the Tamil Ratna Award? 14. Name the two sportspersons who have been recommended for this year's Rajiv Gandhi Khel Ratna award, India's highest honour in sports?